Scandalous data published by the ABC has revealed the shockingly low threshold for entry into tertiary teaching programs. These low standards, it is insinuated, are directly linked to the declining outcomes of Australian students in international tests. On one hand, there are some legitimate concerns here: if our teachers cannot grasp basic concepts, how are they supposed to teach these ideas to impressionable young minds? But this problem isn't with who gets accepted to university; it's with what happens to them while they are there. After all, if more than ten per cent of potential teachers cannot pass the patronisingly low bar set by mandatory literacy tests (aimed at a year 9 level of aptitude), then how have they managed to make it through a tertiary degree? The unspoken assertion of Craven is that universities will weed out those unsuitable for teaching, with the rest being tempered in the flame of higher education until they are sharp teaching implements. Unfortunately, this is not borne out by evidence. In his brilliant paper, What Doesn't Work in Education: The Politics of Distraction, Professor John Hattie notes that 'teacher-education programs have among the lowest overall impact of all the influences on student achievement'. It is important to note this does not mean that teacher education programs do not have the potential to be transformative, just that they currently are not. Hattie goes on to note that the time where teachers learn the most about their craft is in the first year of full-time teaching. While it might be expected that hands-on experience leads to greater learning, the research also reveals that university courses woefully under-prepare new teachers for entering the classroom; most first-year teachers experience significant 'transition shock'. "I was one of the lucky ones: when I got to my practicum, I discovered that I actually enjoyed teaching. Some made it through four years of a degree to find they did not." Hattie's conclusions mirror my own experiences. Even though I learned a hell of a lot, my first year of teaching was a haze of stress, confusion and burnout. Given these factors, it's understandable why teaching's attrition rate is so high. In my own tertiary education, the topic of pedagogy was rarely broached in any useful way. Except in the occasional elective, my Bachelor of Education was highly theoretical and devoid of practical application. I came out of the first three years of that degree as someone who could have developed good educational policy, but would not have been able to teach. It wasn't until my final year, in light of going on our first placement, that the realities of the classroom were discussed. Even then, most of the discussion was how to translate curriculum into lesson and unit plans. Behaviour management, rapport-building, and public speaking skills were touched on in a cursory way at best. For the most part, we talked about content, not about teaching. I was one of the lucky ones: when I got to my practicum, I discovered that I actually enjoyed teaching. Some made it through four years of a degree to find they did not. Teacher education programs need to be changed, but not with the application of yet more paternalistic literacy and numeracy tests or the overly-simplistic solution of stricter academic thresholds. Instead, universities must refocus on the practice of teaching, and help their students move into professional practice. There is also a broader cultural issue at work here. We must kill the idea that 'those who can't do, teach'. Though it is true for some, very few people I know became teachers because they failed to achieve their real calling. The pernicious attitude exemplified by this old adage is the reason why universities can be so lax with their entry requirements. There is, however, a grain of truth in this statement; our society devalues teachers in a very literal sense. Teacher working conditions are poor, and while our starting pay-rate is good there is little room for it to grow. In a culture where the almighty dollar is the benchmark of success, you must truly view teaching as your vocation to choose it when you have other options. If we want to attract the highest calibre of candidates, we have to make the profession palatable. Obviously, a certain amount of passion is required in any job, but there is a middle ground between 'martyr' and 'just in it for the money'. Working conditions must be improved, politicians need to start listening to the needs of teachers, and parents and carers need to start trusting that teachers are professionals. Thresholds at universities only help with the perception of quality, but do nothing to address the fact that high-achieving applicants are simply not drawn to the job. Hi Tim, As a retired teacher who left teaching a decade or so ago and whose wife is still at the Chalkface, I totally agree with your comments. The University courses I completed while informative and interesting, did not prepare me for the reality of the classroom . As you so aptly observe it was a massive culture shock when I went into the high school classroom in my first Term all those years ago. To add to the pain I had little or no support from my Subject Master, just 'nit picking' , no effective advice or strategies were given, I just had to sink or swim. One of my daughters was intending to follow her mother and I by going into teaching a few years ago. Her experience in the Practicum was so negative , she decided teaching was not her forte I hope today that beginning teachers are being given a lot more help and assistance in their first year, it is essential. Sadly with the massive work load placed on the teaching profession these days, most supervisors do not have any time to observe, let alone, assist their student teachers. THIS MUST CHANGE!!! Finally the ASAT score is NOT a predictor of teacher proficiency, a sound practical University preparation IS! I think we were better off with the old system. Students did a degree in science, arts, economics or whatever was their preference. Then they did a one year diploma in education with the emphasis on the practical side of teaching. That way they were more proficient in their specialty and they were better performers in the classroom. Degrees emphasizing the theoretical side of education deprive both teachers and students of both. I believe the best teaching occurs when the teacher has a love of his or her subject(s), especially one that has been inspired by his or her own teachers' love of their subject(s). For some time now there has been in circulation a mantra, "I teach students, not subjects": a serious misconception that ignores the basis of teacher-student relationship. Chances are that if teachers love their subject(s), they will be motivated to explore and implement the most effective methodologies available in their subject areas, and that their enthusiasm will be shared by their students. Moreover, it's a cost-efficient way for improving the quality and outcomes of learning! I am amazed by this article and very saddened by it. I did my teacher training at a Catholic Teachers' . Students knew we were wanted and received a great deal of assistance from lecturers and teachers we met on placement. We were taught to plan a lesson as well as write a blackboard summary, so going into a class room for 1 lesson, I knew I was prepared. The supervising teacher pointed out where I did well and how to improve in other areas. Tim does not mention that. Do students not get that information/training any more? My first year 'Out" I did spend my 3 day weekend because of public holidays and feast days, preparing work, but I was greatly assisted by the Principal and other experienced teachers. What a shame it does not happen today. While there is some commonsensical truth in this piece, I would not advance Greg Craven's views as an explanation for the difference between good and bad teaching. For a start, ACU was the only Australian university in which the Dean of Education lacked doctoral-level qualifications and where the supervision of student teachers was at one stage so formulaic in their professional practice that they turned out to be mere cyphers of those who trained them. It was this kind of teaching-apprenticeship, ensuring student cloning, that fell out of practice when it became obvious that the epistemic foundations of any disciplinary-base are never static, whether relating to content or method. 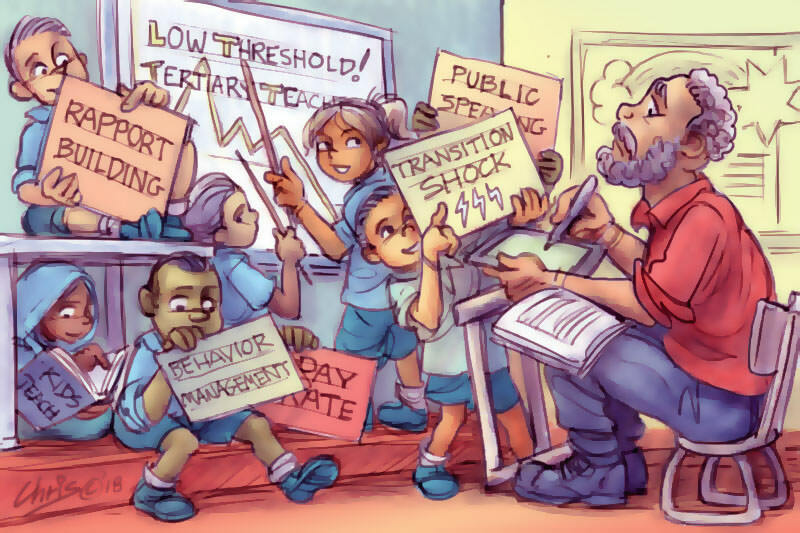 The major warfront in teaching in the past two decades has instead been between critical pedagogues (at the better universities) and those old-fashioned 'practical teachers' from pre-binarial colleges of advanced education. The death-knell tolled for the latter, when the binary system was abolished by the James Review in the UK and shortly afterwards overhere, and the marriage, while often not a happy one, advantaged the graduates of some of the better universities that agreed to such an amalgamation. Hence three tiers of graduates to reflect Australia's hidden but highly-stratified teaching profession! My experience of Dip Ed in a Catholic Uni was one of disappointment. As a mature woman I was treated like a child. A hang-over of being a teachers college perhaps? My prac. experience was traumatic. I would escape the locked gates at lunchtime and go and sit with the Muslim taxi drivers. I felt safer there. The teachers were bullies.